"Respi" for iPad & iPhone is an application available in 10 languages, which caters to office workers whose jobs mean that they stay in the same posture for too long. "Respi" is a daily set of exercises, devised by the professional osteopath Anne Beatrice Leygues, which allows them to get their breath back. The new application of well-being sedentary will allow to get better and better next step, simple exercises, games and effective. The exercises are designed to be carried out in the workplace. The 3 pillars necessary for well-being are respiration which stimulates blood circulation, self-massage to warms the muscles, and adopting a posture which loosens and strengthens the body. 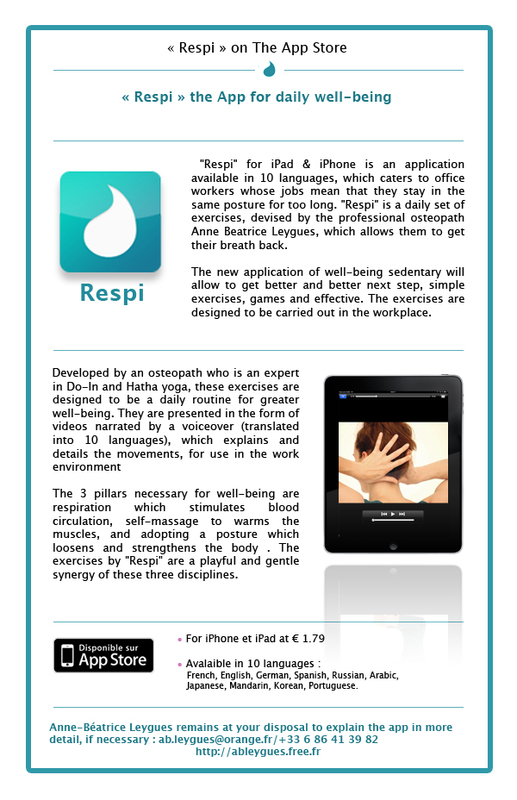 The exercises by "Respi" are a playful and gentle synergy of these three disciplines.